This Sunday, we were featured in the House + Home section of the Kansas City Star. In the article, we discuss some of the design challenges that come with vaulted ceilings. We have developed a few tricks over the years for making the most of this dramatic architectural feature. Here, we included some photos from our portfolio, along with advice on how to best highlight vaulted ceilings. 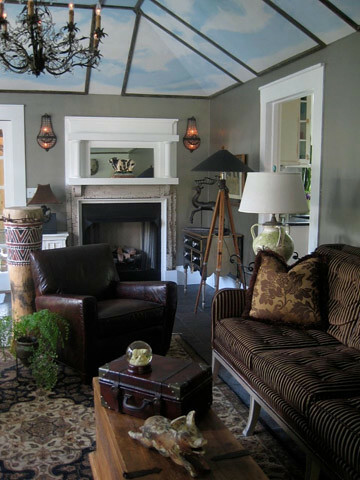 In rooms with vaulted ceilings, we’ve utilized paint to create very different looks for our clients. 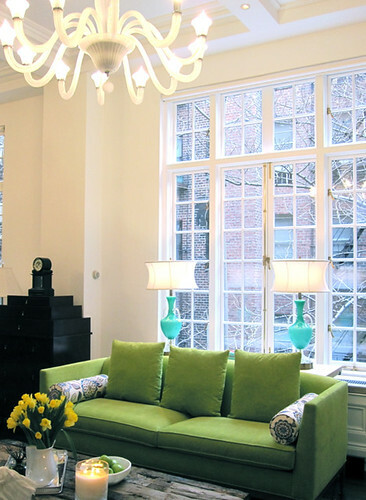 In this first photo, we kept the room in various shades of white to create a spacious, sophisticated space. By using white from floor to ceiling, we were able to highlight the striking light fixture and make the room feel very tall. On the flip side, you can also create interest by painting the ceiling a different color than the walls. Here, we took it one step further by adding clouds. When furnishing a room with vaulted ceilings, it’s important to think of the entire space. 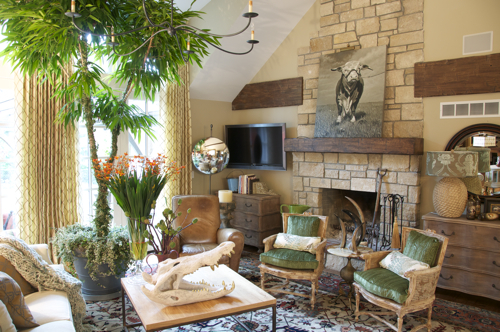 Items with a lot of height, like a beautiful plant, can help add interest to a room, while keeping the space cozy. There’s nothing quite like tall windows and vaulted ceilings to make a room instantly interesting. In the project shown below, we wanted the room to appear larger, more spacious and have a free, open look. After all, the project was in New York, and that feeling is worth its weight in gold there. Adding a chandelier or dramatic light fixture in the same color as the ceiling was just the icing on the cake.